So this will be my first real post in quite a while, so I do wonder if anyone remembers me. Anyways, I always remember everyone trying to come up with ideas on how to properly mix Fire and Frost as a dual faction, but with no real resolution or agreements. I just recently realized last week that I could actually play the limited beta of BF and I have been playing religiously since then. I then remembered about the dilemna that concerned this debate for years, and decided that I might give it more thought. And give it more thought I did! I'm very confident in my idea mostly because it just sounds fun to me. There has never been a "spell slinging" strategy in this game yet compared to many other TCG games, and when I realized this, inspiration hit me like a brick. What if we made Frost and Fire a spells matter faction? So my logic begins from here, everyone who has thought of the idea of making this Fire/Frost faction has always battled with the fact that offense and defense do not combine very well in a way that doesn't make it a little more on the broken side, so I said, what does the heat and cold create? Storms and even tornados if the conditions are right. So from there, I came up with a theme. So I combined the storm idea with spells, and obviously enough, their main mechanic could be "Spellstorm". Before I go through what Spellstorm is, I also thought about the lore of this Fire/Frost faction. I deemed them the "Apostles of the Storm". They just want to see the world churn (in a storm). They attack as fast as lightning and can ride the oncoming winds to victory. This faction could easily set up for another part of the campaign where you have to save the world again again from these guys. So here, Spellstorm would read in the sense, "Whenever you play a spell, Storm Raptor gains 15% damage for 10 seconds; this effect and stack up to three times". That means if you were to play a Homesoil or Eruption with this guy on the field, he would basically gain 67.5 damage not including homesoil, and if you add other spells, it will buff up to three times which makes its attack a wopping 652.5 for a couple seconds, which is pretty decent. --> He should probably be a rare yeah? 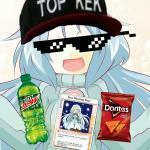 Refresh reads, "Reduces the cooldown of all other spells in your deck by 20 seconds. Additionally, all spells you play for the next 10 seconds require 15% less of the usual power cost". Now that's a spell enabler if I ever saw one. Here would be a great way to be able to spam more spells to get those Spellstorm procs off. Though what if you just want to play a spell for cheap? 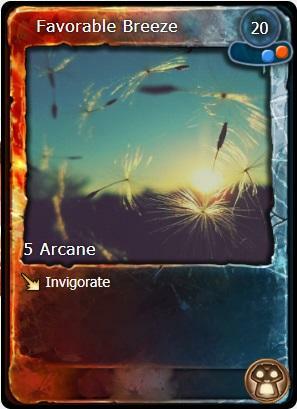 Invigorate reads, "Invigorates targeted friendly unit with a newfound strength: it gains swift speed for 20 seconds and takes 15% less damage for 10 seconds". Something cheap and simple. Can be useful as a way to let a unit get past some obstacles, or just let's you get in a very cheap Spellstorm proc. Though I don't want to think of a Construct with swift . So let's go through what the ability does, shall we? "Casts a massive spell storm that deals 150 damage per second to enemy units and buildings in a 30m radius, up to 600 in total, for 10 seconds. If another spell is played within this radius, the duration is extended by 5 seconds, and the damage dealt is increased by 50, up to 200 in total. This can only be extended a total of 10 times. Additionally, enemy units can only move at walk speed inside the radius". Here is what will be able to kill everything, especially when there are more players . I'm sure the spectacle will be more than worth the cost. So that's what my idea for the Fire/Frost faction would be. You can definately point out whats overwhelmingly op, but I'd like to think I made things decently fair. What do you guys think about the name "Apostles of the Storm"? 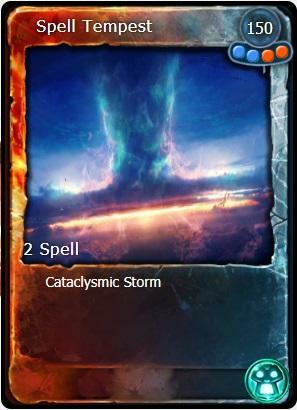 What about the Spellstorm mechanic? I do eagerly await your thoughts on the faction, have a good day! Edit 2: it just occurred to me that it might be possible for Spellstorm to count your opponents' spells too. How would that sound? Edit 3: I think I might need to clarify, but this thread is more to showcase what might be possible with this mechanic and cards that can synergize with it. The specific cards don't matter too much. If it comes with steampunk infantry, mutated elementals, and shoots all manner of brimstone, ice shards and electricity all over the place sign me up. 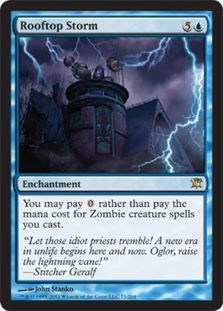 I'm not conventionaly a fan of enforcing card design that survives on dependencies (so, cards that are below rate by themselves that require other cards being cast in order to be competitive) as that is a slippery slope that restrains deck choices, but provided the new faction's cards were to be balanced around a healthy game state where the usual culprit spells (eruption, lava field, coldsnap, disenchant, ravage and so on) were considered (so, not designing the cards in a vacuum, but also not considering always having access to them) there could be a decent set to be made out of this idea. I'd like to see some units that have non-combat supportive text that affects either the owner's or all friendly players' spells in their vicinity. So maybe a boost to damage spells, or extended CC duration, or some immediate void refund - and of course some nice active abilities that have a lot of flair. I'd like to see some units that have non-combat supportive text that affects either the owner's or all friendly players' spells in their vicinity. So maybe a boost to damage spells, or extended CC duration, or some immediate void refund - and of course some nice a﻿﻿﻿ctive abilities that have a lot of flair. I'd have to disagree with your dislike of a little dependency on a specific strategy. I like cards that do something a little more specific, so I can snoop around for cards that could possibly synergize with it. Of course, I wouldn't take it to the degree Yu-Gi-Oh did, with all the archetypes and such, but a little less broad effects can also be very engaging. I do think some one the synergy spells have to be a little better and perhaps more versatile to be able to be good stand-ins for the usual staples though. As for the other suggestion, I do like the idea of adding units with less up-front mediocre stats with more passive effects that just enable spell-spamming/spell-empowerment. I just wanted to go over the core mechanics of what this faction would be doing. I think these "support" units could probably end up being mono colored because they don't have the faction-theme mechanic. This does end up being a lot of power that you have to invest into it all though (spell-enhancer, spell payoff and ofc the spells), so it would probably have to settle in cheap buildings (like Embalmer's Shrine) to be able to get the necessary buffs to spells. I think this is the best idea for this colour combo, and it certainly feels like MTG's Blue-Red, which is mostly about Sorceries or Instants. This could only be goo for the game, specially if it has an "Elemental" heavy theme. Balancing ignored it sounds like fresh idea and u put some effort.But it's gonna be a long road before think of new cards are added to the game. Anyway the forum can need any kind of activity Imo. b) you also can spawn more units of just Frost and Fire, and be good with just that. That depends on how good/bad new cards are [Twilight reminder]. So basically with such mechanic/feature this faction basically resembles the idea of Harvester - spawn once, and keep it alive as long as possible through spells only. Although Harvester is a powerful beat-stick, those are less powerful, hence you are left with a cosplay of harvester gameplay, because they depend on spells a lot more and without them they seem even weaker than regular Frost/Fire cards, or at least depend on them more, than just regular cards. Although Frost already has a synergy with buildings (Lyrish Knight, Ice Guardian, Home Soil, White Rangers, Icefang Raptor), but all of these are weak without a building around them, but unlike Spellstorm mechanic, they gain a permanent benefit from a building around them and not a temporary, which makes them stronger than Spellstorm cards, which gain temporary benefits from spells (10s only, and even it was 20s, still it is temporary only). This is a power drainer feature, which is a bad compared to others. If something, i'm talking about PvP rn. 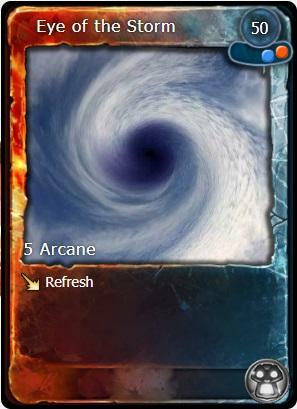 Moreover new mechanic and just new cards should also consider old cards, which means some might become broken(op), such as Eye of the storm, that heckin' refreshes all cooldowns and also they cost less. Let's see: Disenchant (80) + Eye of the Storm (50) + another instant Disenchant (68) = 198[210 required]; Coldsnap (75) + Eye of the Storm (50) + another instant Coldsnap (64) somewhere else, or if you missed into Netherwarp = 189[200 required]. Ravage (50) + Eye of the Storm (50) + Ravage (43) = 143[150 required]. Does anyone ever spend so much power in just few seconds to cast spells? Does anyone even have so much power in the first place to be spent? Maybe, but usually there is just about 50-120 depending on deck's faction and situation. It is usually better to have more units on battlefield, than somewhat questionable unused power for spells. Shrine is Broken OP. Btw the Phrase is - immediately reusable (Look up Eruption). -> your teammate(s) casts Enlightenment, spawns something within Breeding Grounds, then casts it again, and again spawns something...-> GG. Overall units are not that valuable, because they kinda require an upkeep in power to perform greately. Usually you'll use Home Soils and Coldsnaps, and might be Ravages as a heal. That's if you use a regular all around deck. If you would use a specific deck for a given scenario or rPvE (they have a special build), then it all depended on how broken/useful the card is. For example: Favorable Breeze - which unit really needs it? Take a note - a single one... I can't find any real situation. Maybe there might be a situation or too. So, it's a PvP card. 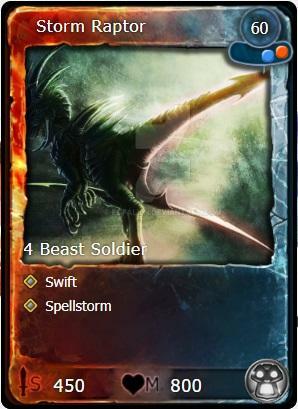 Storm Raptor - miserable compared to Icefang Raptor, although it is swift, but in PvE you are not that dependent on fast units, but it is a good feature anyway. Storm Walker - stats are worse than of Sunderer U3, considering it's a Melee unit. In total is alike Lyrish Knight with a building and a Home Soil, also costs around the same (Lyrish+Ice Barrier+Home Soil). The difference is, Storm Walker has everything already, so why would you need a Lyrish Knight in that deck? Hence it foreshadows another card(card combo), which is not ok. It rather should give something new, or cover holes of the deck. If it was L/L, then it would have been interesting, because there is actually no L/L unit in such a deck. But then it is insufficient and foreshadowed with other faction's L units - Vileblood, Lost Reaver, Deep One, Spikeroot (but it has a bit different idea). So, Storm Walker be better have a bit more HP, at least 1100, because then you would still use some spells, like Ravage+Eye of the Storm+Ice Barrier+Home Soil(154 in total). Spell Tempest - welp, it looks good in rPvE for sure, besides it is actually OP in team, absolutely useless in solo. By the description it prolongates duration, which means duration of the spell, not the debuffs that are applied. Hence you are left with: Unity, Home Soil, Ward of North, Retreating Circle, Glyph of Frost, Scorched Earth, Mines, WinterTide, Ice Age, Architect's call, Global Warming. That's about it, because everything else is has instantaneous or such alike effect. For dmg every DPS is ok.
did you think people do not know how to use "find image (google)" ? \:D You can keep 5 BFP to yourself, not really in need, neither i would find a use for them. It seems that my capabilities as an card designer are still lacking for the pvp aspect, but there's always room for improvement and changes to make it fit within this game that is BattleForge. First off, I feel like it would make sense to give the Storm Raptor the ability of Crippling Bite, as well as a couple of stat buffs. It makes sense not only in the color, but it can really use the slow to be able to take advantage of it's limited attack boost. I made Storm Walker's stats so low because I didn't want it to be busted, but I guess I might have overdone it with that. I honestly didn't put much thought into the attack type, but those can also be changed and adjusted to better fit the type of decks they want to be in. 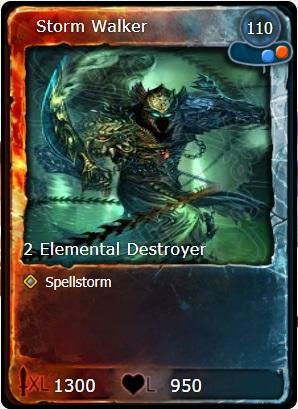 Perhaps Eye of the Storm could cost less if you're wanting to actually be able to recast something. Though I was trying to go for the wording of Breeding Grounds, where it still would cost the same as it normally does, but you actually pay the reduced amount. 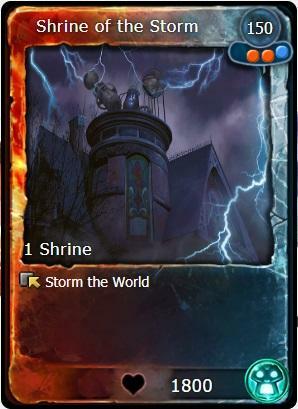 As for Spellstorm itself, perhaps it can count buildings as well? I don't know how much sense that would make flavor wise, but it would definately make it more playable. If we wanted to make it more meaningful in pvp perhaps we could buff what it did, but make it so it only stacked twice, to lesson the burden of how many spells you would need to cast to make it effective. We could even make it a 1 stack thing and playing another spell would refresh the timer on it. I appreciate the feed back so far, and it seems that there is always something to improve. I'll see what I can do to add these changes, but what do you think? Do you think Spellstorm has a chance? I think there is definetively a good case for it, even if it is a bit unbalanced (as long as not egregiously so). Nomad + Eruption is already a valid PvP opener, so anything else to follow suit on a "spells matter" deck, with few creatures but a lot of damage and control spells, can only make it better. Frost finally has their swift t1 unit Pog. One question though, why are you posting this on my thread? I do like the idea, but I think it would deserve a thread of its own. I want to start by saying: I'm more of a campaign and RPVE enthusiast than PVP. In fact, I detest PVP in most games, more often opting for co-op / horde / survival modes where offered. Furthermore. Frost isn't even my preffered colour at T1. I like them more than Shadow and fire, Even though I try to like all colours equally, but I do, 70 % of the time start on Nature. So as someone who cares little about the game mode where swift has the biggest impact and as someone who isn't 110% enthusiastic about blue to man the ramparts and defend their honour with my life. But I can, from a point of logic see and understand that swift makes frost 100$ unviable for pvp, where maps are needlessly large and covering a large distance more rapidly can in some cases determine the outcome of the game. Maybe they don't need 4. But they something. Just to put them on the map. One other possible fix it to give every unit in the game swift after it is not in combat for 5 seconds. Frost has zero swift units at T1. Nature has has 4 swift units at T1. (Again, two affinties of amazon count, they both have swift. Maybe, JUST MAYBE, Frost would have gotten some love with the Amii expansion if EA didn't pull the plug. With the exception of one colour, each of them seemed to have had to have "wait their turn". Nature is the above mentioned exception and has received additional units at T1 in every expansion. Frost saw the same amount of love as fire did when renegade launched, but has seen no additional units since. Not even in amii. Frost is not only the only unit to have not have swift at T1, they're the only colour to have "Slow" as a passive keyword on their units. At T1, right the way through to T4. This makes construct and battleship useless after the battle you drop them in to is over. Oh, I have so many Ideas for the Frost/ fire tribe, my fanmade collection ideas fall into a tribe called Steamcore. But when building steamcore, you have to look at T1 first. A building is only as strong as it's foundations. Which currently means start red. And I don't like that. Well there you go, that's all you needed to say from the beginning lol. The way I see it, Frost T1 is pretty strong overall. Whether or not it needs a swift unit has been debated since the very beginning, and honestly I am kind of against it. I've played against a lot of Frost t1's, their units are very powerful for the cost, and you basically always have to contend with ice barrier and homesoil for any engagements. You litterally lose fights if you try to S unit spam because of frost mage. 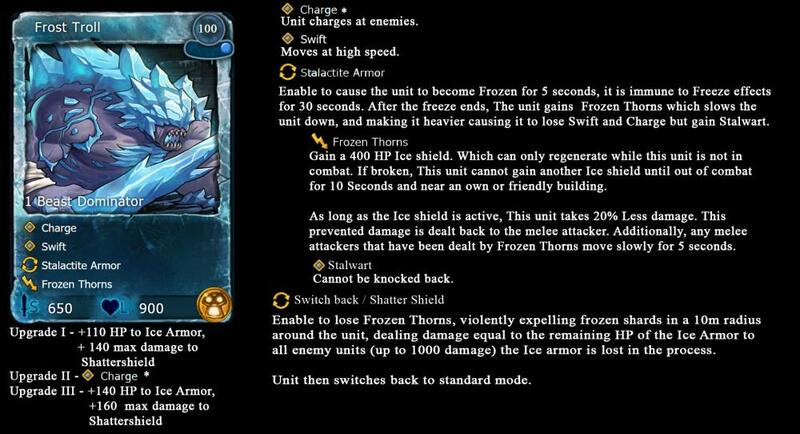 As for not having a way to slow units down, what about Frostbite? Frostbite is a very powerful card when used right, I know I hate it especially when I try to run away. If you play starcraft, then a great comparison is a Terran Mech slowpush, where you slowly crawl towards the opponent with squads of siege tanks, all taking turns moving forward while others wait, covering the ones moving fowards, it is a very hard to stop maneuver. Ofc they do have trouble vs building spam like Mortar and Phase Tower, since they can't move fast enough to engage with it, but that's a problem for a different day.